Enterprise Architect supports round trip engineering of Ada 2012, where these conventions are used. Corresponds To: A Package specification in Ada 2012 without a tagged record. Corresponds To: A procedure specification in Ada 2012. Corresponds To: Access to a subprogram. Corresponds To: An enumerated type. Corresponds To: A record definition. Corresponds To: A type definition, subtype definition, access type definition, renaming. Corresponds to: Aspect specification (Precondition and Postcondition of Subprogram type 'invariant', subtype 'predicate'). 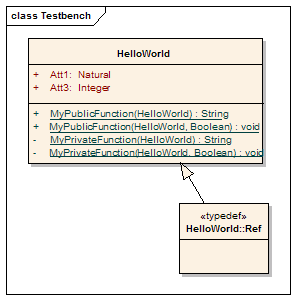 Corresponds To: The instantiated unit's type (Package / Procedure / Function). Corresponds To: Determination of whether the parameter is an access variable. Corresponds to: Aliased function parameter. Corresponds To: The type's discriminant. Corresponds To: The part type ('renames' or 'new'). If 'Value' = 'Access', set 'access type'.